Today is the deadline to register to vote in the March 1 primary elections. Primary elections get a lot of attention during years like this one, when presidential candidates appear on the ballot, but the purpose–and importance–of these elections is often overlooked. In a nutshell, primary elections narrow the field of candidates; oftentimes, more than one Democratic candidate or more than one Republican candidate will file to run for a particular office. For example, right now there are three Republican candidates running for State House District 90, and there are two Democratic candidates running for State House District 30. Primary elections are important, because they help narrow the list of candidates down so that no more than one candidate from a particular party appears on the ballot at the General Election in November. In Arkansas, the primary elections are also important, because judicial candidates are on the ballot. The March 1 primary elections provide an opportunity for Arkansans to vote for candidates for Arkansas Supreme Court and so on. If you or a member of your family is not already registered to vote, today is the deadline to register in order to vote in the primaries next month. You can find out more about how to register to vote by going to the Arkansas Secretary of State’s website. After you register, don’t forget to head out to the polls on Tuesday, March 1, to vote in the primaries. If you want to know more about where the candidates stand on important issues like abortion, education, marriage, taxes, and so forth, you can go to www.ArkansasVotersGuide.com. From there you can view the candidates for federal, state, and judicial offices, and you can order printed copies of the Arkansas Voter’s Guide to give to friends and family members or pass out at church. 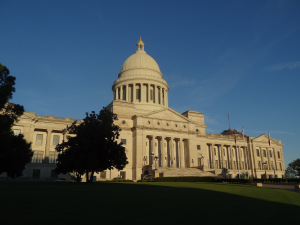 LITTLE ROCK, ARK.—On Thursday Family Council released its voter’s guide for the 2016 Arkansas Primary Elections. Last Tuesday was historic for a number of reasons. Republicans practically swept the election at every level in Arkansas. That’s a first for our state. Arkansas also saw record voter turnouts, at least for recent history. We said it would be impressive if 800,000 voters came to the polls this year. It is estimated that more than 850,000 voted in this election. That’s incredible for a midterm! 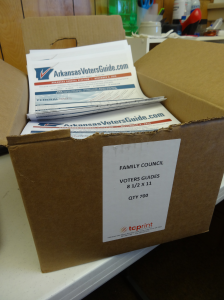 The election was unique both in voter turnout and election results, but it was also unique in this: Family Council distributed enough Arkansas Voter’s Guides to reach at least 1 out of every 5 voters–and maybe many more than that! We distributed nearly 175,000 printed copies of the Arkansas Voter’s Guide, and more than 11,500 people visited our online version of the guide at www.ArkansasVotersGuide.com. Assuming everyone who requested a guide or visited our website was a voter, we distributed enough voter’s guides in print and online to reach 22% of the people who voted last week. Even if some of the people who looked at our guide decided not to vote, many copies of the printed guide went to couples or groups of people–such as Sunday school classes–which means they were shared and used by more than one person. I would estimate each printed copy of the guide we distributed was used by anywhere from 1 to 3 people, at least. That means that while we distributed enough copies of the Arkansas Voter’s Guide in print and online to reach 22% of the voters, many more probably saw a copy of our guide. It is possible that as many as one-quarter or more of voters put the Arkansas Voter’s Guide to use this year. Hats off to everyone who helped make that happen! To the people who donated money to fund the Arkansas Voter’s Guide this year; everyone who ordered copies of the guide for their friends and neighbors; and all the folks who passed the guide out at work, at church, or wherever, thank you! You helped us serve the people of Arkansas in a very real way. I hope you will continue to follow the work of Family Council in the days to come. We plan to have some exciting announcements between now and the end of the year, so stay tuned. And be sure to follow us online at www.FamilyCouncil.org, on Facebook, and on Twitter.